Done right, drywall projects provide more dramatic change than almost any other home remodeling task. Done wrong and you’ve got an unavoidable, expensive eyesore. Where many DIYers believe that drywalling is a labor-intensive, yet fairly easy task to complete, it does take an expert touch to create the flawless, seam-free look you hope for. Even the smallest drywall repair can be an obvious blemish if not done correctly. Understanding the challenge that drywall projects present, our drywall techs have all been extensively trained in drywall hanging, taping and mudding techniques as well as quick and invisible repairs. With decades of experience, we’ve literally hung miles upon miles of drywall slabs, creating the look and functional use that both home and business owners require. From pin-hole-size caulking to building walls and barriers from the foundation up, we are your Top-Rated Local® home remodeling experts, specializing in drywall repair and installation. Yes, we’ll repair holes created by door knobs. Yes, we’ll mend cracks and picture damage. Yes, we’ll replace drywall damaged by moisture and mold. And of course, we’ll add new drywall where needed, mudding, taping and texturing new walls, ensuring flawless finishes. 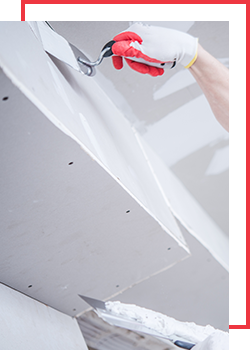 Find out more about how Diversified Construction can help you save time, effort and money by scheduling your free drywall project estimate today. We promise our very best workmanship or we’ll do it again, no questions asked.